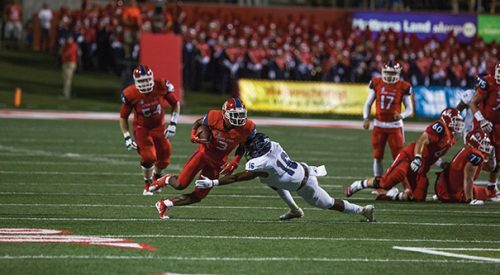 A new tailgate policy took effect at Fresno State before the start of Thursday’s season opener against Abilene Christian. Tailgaters who park in the blue, white or red lots on the west side of Cedar Avenue are now allowed to stay at their tailgate spot while the game is being played. Fans are also allowed to stay at their tailgate spot for two hours after the conclusion of the game. “Lots will still open four hours before the start of the game, but there are no in-and-out privileges,” Paul Ladwig, senior associate athletic director said. The decision came after fans were surveyed earlier this year. Athletic director Jim Bartko had revealed the new tailgate policy at a press conference in June. Bartko said fans shouldn’t have to put their tent away an hour before the game and go to the stadium if they would rather stay out to continue tailgating. He added that the new policy makes it more convenient for families with children who prefer to stay out and play catch. Fresno State is also attempting to enhance game-day experience with the newly-branded Toyota Drive, formerly known as Bulldog Boulevard. Attractions on Toyota Drive include food truck alley, remote control race tracks and a kids zone. Victory Valley, which was recently located in the Red Lot, has now been moved to the east-side seating bowl of Bulldog Stadium and the soccer and lacrosse field. Beer will be served at Victory Valley during the pregame tailgate, but entry is restricted to persons 21 years of age and older. Other changes for the game-day experience include an aerial show featuring a skydiving team, flyovers and Fresno State’s blimp, Bulldog1. The new video and ribbon boards in the north end zone add offer more replays, highlights and out-of-town scores.